God of justice, Father of truth, who guide creation in wisdom and goodness to fulfillment in Christ your Son, open our hearts to the truth of his Gospel, that your peace may rule in our hearts and your justice guide our lives. Through our Lord Jesus Christ, your Son, who lives and reigns with you in the unity of the Holy Spirit, one God, for ever and ever. Faith and Patriotism | Archbishop Charles J. Chaput O.F.M. Cap. The Philosophy of American Patriotism In the Present Crisis | Fr. H.F. Tiblier S.J. What Is Patriotism? | Fr. Stephen J. Brown S.J. Today is the national celebration of our Nation's independence. As we celebrate let us remember to pray that God will strengthen and bless America and make our nation a haven of liberty and justice for all — born and unborn. On April 19, 1775, American minutemen faced English soldiers on the village green in Lexington, Massachusetts. Someone — no one to this day knows who — fired a shot, and a battle followed which marked the beginning of the American Revolution. After the Battle of Lexington, the desire of Americans for complete independence from England grew stronger. Less than a month after that battle, the Second Continental Congress met in Philadelphia. On July 4, 1776, the Congress issued a Declaration of Independence, announcing "that these united colonies are, and of right ought to be, free and independent states." For a time it seemed to some that the fight for independence was a hopeless struggle, but an important American victory at Saratoga marked a turning point in the war. After that victory the Americans gained a strong ally, France. With the help of France, the Americans went on to win a final victory over the English at Yorktown. The English Parliament then decided to make peace and accept American independence. With independence won, the thirteen states set out to form a new nation. There were strong differences among the states, but Americans came to understand the need for unity, and devised a new plan for government—the Constitution. 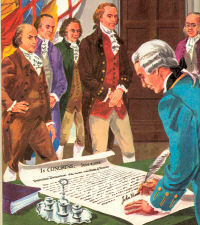 The new government, under the Constitution, was faced with many problems, both at home and abroad. However it found ways to solve these problems, and the United States began to grow rapidly. Excerpted from American History, published by Laidlaw Brothers. Read the Declaration of Independence and see what grievances our Founding Fathers had with England. This same site offers links to learn more about the founding of our nation.